I hope that you decide to take a trip to NYC soon because I discovered a new restaurant for you to try! 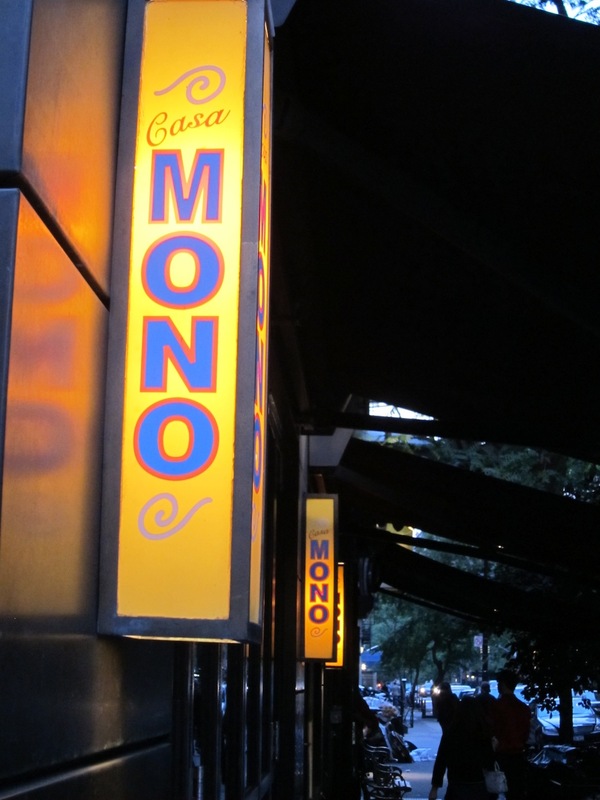 It’s called Casa Mono, a Tapas restaurant in the heart of Manhattan. My taste buds were dancing! I am so happy that I scored a reservation for this restaurant. Food network Chef Mario Batali is part owner of this restaurant so believe it or not, I was sceptical about eating there. Its not because I think that Mario Batali isn’t a good chef; I’m sure he is. However if you’ve read my other restaurant reviews, there is nothing that upsets me more than a famous chef that doesn’t care what they associate their name with. I have been disappointed one too many times. As a matter of fact, another of Mario’s restaurants, Esca, also in NYC, was nothing to write home about. It was really the menu items that Casa Mono had to offer that drew me in. Mario Batali spent part of his childhood living in Spain which spawned his great love for the cuisine. He even wrote a book with Gweneth Paltrow that outlined their tasty journey through Spain. I have it, its a great book containing recipes and funny anecdotes about their travels, travel habits, likes, dislikes and the interesting people they meet along the way. Its called “Spain, a Culinary Road Trip”. Ok now, from Spain to Manhattan. 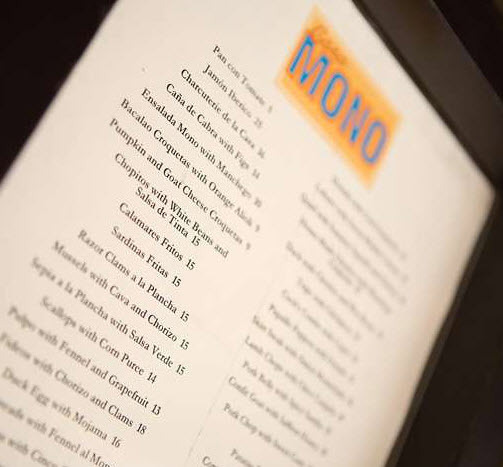 Casa Mono is cool, cozy, lively, fun and best of all you can sample a multitude of absolutely mouth watering spanish dishes. Well, Casa Mono may not be in Spain but I surely understand what she meant about the cuisine. What are Tapas?Tapas are a wide variety of appetizers, or snacks, in Spanish cuisine. They may be cold (such as mixed olives and cheese) or warm (such as chopitos, which are battered, fried baby squid). 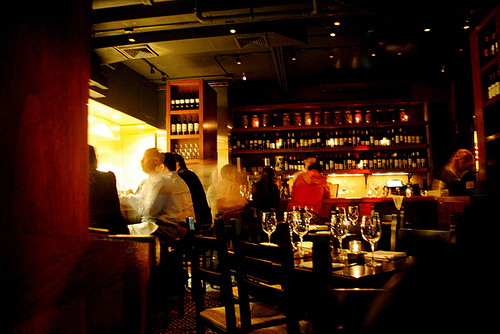 In select bars in Spain, as well as some parts of North America and the United Kingdom, tapas have evolved into an entire, and sometimes sophisticated, cuisine. In Spain, patrons of tapas can order many different tapas and combine them to make a full meal. Other countries have Tapas too – In Italian we call them Sfizi and in Greek, they are called Mezze. Bacalao Croquetas with Orange Alioli – Bacalao is cod and croquetas are fritters or croquettes. These were very good but a little salty. They were shaped like cheese sticks but inside their golden crispy coating, was a mixture of creamy mashed potato and cod. Although it tasted like cod, there were no pieces of it. It was really mashed in. I prefer traditional cod croquetas. The orange alioli was heavenly though. Spanish Anchovy Montaditos with Heirloom tomatoes – Montaditos are small sandwiches. In this case it was open–faced, like bruschetta. This was my favorite dish. Once again, don’t run for the hills..These are not your usual ultra salty, fishy canned anchovies – These were subtle tasting, fresh and delicate, served on crusty bread with tomatoes and a drizzle of the some of the best quality olive oil that I’ve ever had. I dream of this dish! I dropped some of this on my favorite blouse and I didn’t care! It was worth it – how crazy is that!? I kept repeating, “This is mental!….This is freakin’ mental!” lol I think I must have looked a little mental. I get too excited. Sardinas Fritas – My dad’s choice. Sardines are so good for you. They contain enormous amounts of Omega 3. However, these were fried making it a little less healthy. Sardines are naturally tasty so they don’t need much to make them taste great – just a sprinkle of lemon juice. Pulpo with Fennel and Grapefruit – Pulpo (Octopus) , Grilled to perfection, not chewy. The ruby grapefruit and sweet fennel complimented each other so well. The citrus flavour of the grapefruit cut the sweetness of the caramelized fennel so nicely – very well balanced. Foie Gras with Cinco Cebollas – (Cebollas are onions) Ok. I don’t like fois gras but my husband does. This is THE first time that I actually LOVED, not liked…. LOVED fois gras. I always steal a piece from my husband because I want to like it.. I feel like I should. I’m usually disappointed. Anyway, this time was different. The texture was perfect. It didn’t have that tell-tale livery flavour or overly gelatenous texture. It was accompanied by crusty bread and sweet onions. Heaven. Bone Marrow with Watercress and Radishes – Ok, I did the fois gras but I can’t do the bone marrow, but if you like it then you’ll love this dish because my husband said several times how great it was. Lamb Duo with Saffron Garbanzos and Squash Blossoms – The duo is some braised lamb and lamb sausage. It was unvelivably tender and tasty. Crispy Belly with Sweet Corn and Blueberries – One of my fav’s. This crispy, fall apart-tender pork meat was heavenly with the sweet blueberries. Kinda’ had a sublte bacon flavour – it was to die for! Patatas Bravas – A side dish of flavour-packed potato wedges. An awesome accompaniment. Other info: The service was great! Our waiter was so charming and helpful with the menu. He went through the menu with us and made some wonderful suggestions including the Spanish anchovies. The sommelier chose the wine for us according to our description of the types of wines we like as we are not familiar with Spanish white wines – Yet 😉 She made a wonderful suggestion. ( I forgot the name now…sorry) Just ask for her suggestion, you won’t regret it! Make reservations well in advance (more than 1 week) or ask your hotel concierge to call for you. This worked for us. I guess they always reserve a few tables for hotels. I give this restaurant 4 stars because as you know, I loved every glorious moment and unlike many restaurants with famous chefs, Mario didn’t have to be there for it to be amazing! Good job! Can’t wait to try this place, sounds delicious!